The casual and contemporary style of this upholstered lounge chair and ottoman set is reminiscent of rigid mountain views with strong sloping lines. While smooth upholstered track arms and exposed wood block feet provide the chair with a geometric look, plush pillowed seat and back cushions create a casual comfort for rejuvenating relaxation. 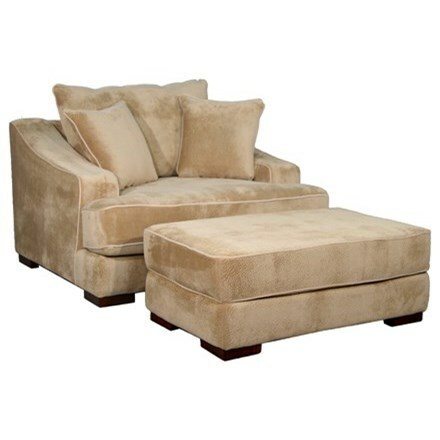 Kick your feet up on the coordinating ottoman to relax even more. 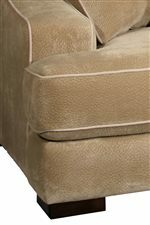 Welt cord trim as a finished seam accent creates a decorative element that is not overbearing, bringing these fine upholstered items a casual look with a nature-like aura. The Cooper Casual Chair and Ottoman with Sloped Track Arms by Fairmont Designs at Dunk & Bright Furniture in the Syracuse, Utica, Binghamton area. Product availability may vary. Contact us for the most current availability on this product. D3687-01 Chair 1 56" 48" 39"
D3687-09 Ottoman 1 49" 30" 19"
Frame Construction The majority of the frame is constructed of engineered hardwoods, which is actually more durable than conventional woods as the layering methods increase the strength. Joints are glued and stapled for added strength and durability. Seat Support Durable 8 gauge sinuous wire springs are used in seats (5 per seat). Seat deck is then overlayed with a dense insulator pad and covered with a polypropylene fabric for added comfort and seat continuity. Padding & Ergonomics Prior to applying the fabric, we pad the entire frame so that at no point will the fabric be rubbing against the frame. This prevents untimely fabric wear and also adds a subtle softness to the upholstered furniture. Warranty Wood frame, spring construction and webbing are warranted to the original buyer to be free of defects in workmanship and materials under normal usage for the life of the product. Come home to comfort with the Cooper collection. Crafted from a selection of the finest materials available, Cooper features a beautiful minx mocha upholstery and decorative welt to visually impress. Plush, comfortable cushion seats and pillow backs offer a cozy escape to sink into and completely relax. Casual with a contemporary feel, outfit your home with none other than Cooper to discover a whole new level of style and solace. The Cooper collection is a great option if you are looking for Casual furniture in the Syracuse, Utica, Binghamton area. Browse other items in the Cooper collection from Dunk & Bright Furniture in the Syracuse, Utica, Binghamton area.